iBall, domestic firm and a well known manufacturer providing it’s services in electronics industry has launched yet another budgeted smartphone dubbed as,”iBall Andi 3.5″ at the Indian shores. iBall has popped up it’s new element under it’s premium series,”Andi” which incorporates nice features but at affordable price. Starting with its display, iBall Andi 3.5 sports a descent 3.5-inch HVGA Touchscreen display. Dealing with the device platform dependency, iBall Andi 3.5 runs on Android 2.3.6 GingerBread Operating System which is expected due to its screen size and resolution, like others in competition , it is also powered with Cortex A9 Single-core processor clocked at 1 GHz. Continuing the Legacy, of introducing most of their Smartphone’s with Dual SIM capability and Dual Standby feature, helps the end user to conceives the transition network by just tapping over the screen. In terms of Photography, this device supports a basic 2 MEGAPIXEL rear camera and a front facing VGA camera as well. Specifications regarding it’s Storage, there is no information regarding it’s internal memory though it support a microSD card slot through which memory can be easily extended up to 32 GB(with such a price tag this device will bagged up with 256MB or 512 MB as per my views). Enumerating it’s Connectivity features, this device support GPRS Dual Band Support, EDGE, Bluetooth with A2DP support. However, to make the phone surfing a bit more easy in control this device support G-Sensor. Some of the pre-loaded apps include Google Play Store which let you download, install and manage both free and paid apps including games. 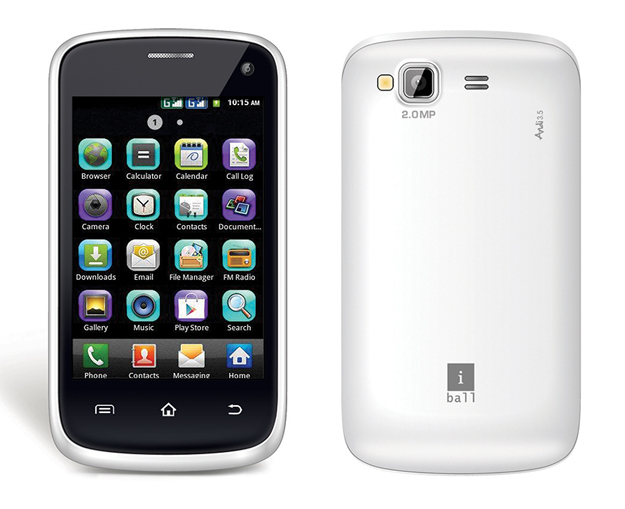 In terms of multimedia iBall Andi 3.5 has built-in music player and FM radio. There is also a document editor that can handle your document editing need on the go. To power it up, this device support 1500 mAH of battery (information regarding it’s talktime and standby time is kept unclosed). The Price of iBall Andi 3.5 is Rs 4,499 and is now available on all the leading online retailers across the country.